Fokker, one of the world's oldest aircraft manufacturers, first began manufacturing planes in Germany in 1912. In 1922 Oakley Kelly and John McReady made history by flying an 11-seat Fokker F4 non-stop coast-to-coast across the United States. Amelia Earhart flew a Fokker plane in 1928 when she became the first woman to fly across the Atlantic. 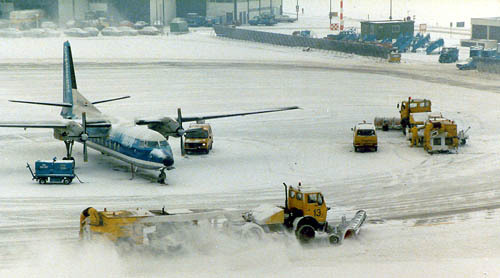 F.27 PH-KFL (c/n 10606) of NLM Cityhopper being freed from its snowy environment; Schiphol early 1980s. In the Netherlands there has always been a lot do about Fokker Aircraft Industries: pride fought with the thought that Holland was too small to sustain a viable aircraft factory... Government loans became (or were considered) subsidies and people, including the government, always portrait our country as too small to compete with the big companies or countries. During World War I, Anthony Fokker had lived and worked in Germany, but he came back to his native country the Netherlands and founded Fokker Aircraft Industries, the main supplier of military aircraft for the Dutch air arm between 1920 and 1940. Between 1911 en 1928, Anthony Fokker developed his company to what once was the largest aircraft manufacturer in the world with factories in Europe and America. However, Fokker lost ground when Boeing and Douglas increasingly applied aluminum in their new aircraft instead of wooden structures. After WW II, Fokker restarted its activities in aviation with the help of the Netherlands government and some industrialists. In November 1958 Fokker delivered its first turboprop aircraft after the War, the Fokker F27 Friendship to Aer Lingus. The F27 became the world's best selling turboprop aircraft till today. A total of 786 F27s were built, 581 by Fokker and 205 aircraft by Fairchild under a license agreement. The aircraft still is a real 'workhorse' among many airlines around the globe. After the F27 Fokker delivered its first jet aircraft, the Fokker F28 Fellowship to LTU in Germany in February 1969. A total of 241 were built. NLM's F-28-4000 "Fellowship" PH-CHD (c/n 11139) is seen at Schiphol. Martinair has had a long relationship with KLM's Cityhoppers, due to a maintenance contract. Towing and the supply of groundpowers are also part of the deal. While this photo was taken in the 1980s, the contract is still valid in 2002. After already having built 100s of other military fighters like the Gloster Meteor and the F104 Starfighter, Fokker assembled 300 F-16 fighter aircraft for the Netherlands Air Force, and also for the Air Forces in Denmark and Norway in the 1970s. Also Fokker was asked to become an associated manufacturer for the Airbus A300, the first aircraft produced by Airbus. Fokker today still manufacturers the moveable parts of the A300 wing, which in total represent about 6% of the aircraft's total value. This is done now by Stork Aerospace, which took over large chunks of Fokker Aircraft Industries. The Fokker 50 demonstrator PH-OSI takes to the air. In 1983 Fokker simultaneously launched the successors of the F27 and the F28, the Fokker 50 and the Fokker 100. The Fokker 50 made its first flight in December 1985, The aircraft, like the Fokker 100, was an all-new technology plane of which a total of 212 were manufactured. In August 1987, the first Fokker 50 was delivered to Ansett Australia. An F50 in front while an F27 taxies behind. Vissible differences are the 5-bladed props of the F50 and different shape of the wingtips. Fokker F.50 U-05 of the Royal Netherlands Air Force is based at Eindhoven, but is an occasional visitor to Amsterdam-Schiphol. Photo 2002. A year later than the Fokker 50, the Fokker 100 made its maiden flight in November 1986 with Swissair as the launching customer taking delivery of the first aircraft in February 1988. A total of 278 Fokker 100s were manufactured. The government and Royal Family also flew in a Fokker product: F.28-1000 PH-PBX (c/n 11045, delivered in 1972). Martinair had the contract to maintain the aircraft, supply crew and catering, as well as logistical and operational support. 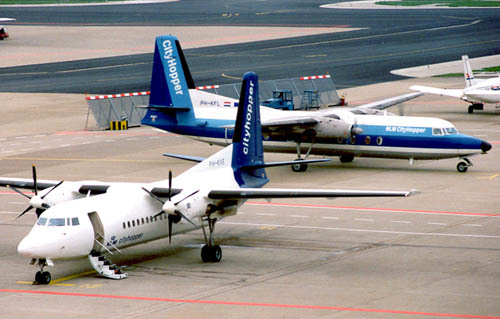 The Martinair Citations PH-MCX and PH-MDX were also much in use as a substitute to the PH-PBX, but could also be chartered by anyone who could pay the bill. The PH-PBX was replaced by the F.70 PH-KBX (c/n 11547) in 1996. The registration PBX stood for Prince Bernhard (Prince of the Netherlands) and KBX for Koningin (Queen) Beatrix. 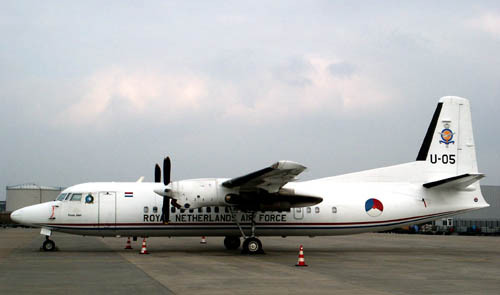 The contract to operate and support the Royal Flight went from Martinair to KLM Cityhopper (KLC), after the initial idea to have it operated by the military (334 Transport Squadron) was abandoned (I think this change was effective 01Jan2006). 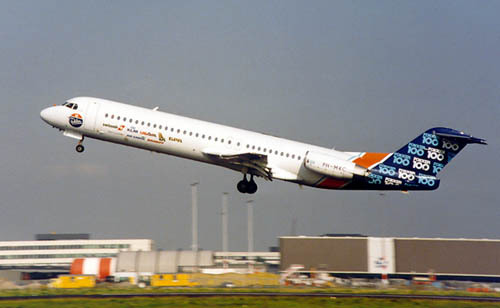 The Fokker 100 superceded the F28 in 1986. Fokker demonstrator PH-MKC is seen going airborne at Amsterdam Int'l. PH-KLE is seen here waiting for a customer. Fokker did not meet the deadline for deliveries to KLM, causing a lot of irritation. It did not help either that another large customer for the F100, Air Europe, went bankrupt. Later two family derivatives were developed. First the Fokker 70, a shortened version of the Fokker 100 of which a total of 47 were built. Second, the Fokker 60 utility was launched as a stretched military variant of the Fokker 50 for the Netherlands Air Force. The worldwide airline crisis of the 1990s, fierce competition and a wobbly dollar unfortunately put an end to Fokker in March 1996. Stork Aerospace and Fokker, follow links "About us" and "History"
In the 09Feb2010 issue of Haarlems Dagblad (Dutch newspaper) I read a fine update on the continued existemce of Fokker..
Anno 2010 the name Fokker still shines in aviation circles, albeit not as an airplane manufacturer. 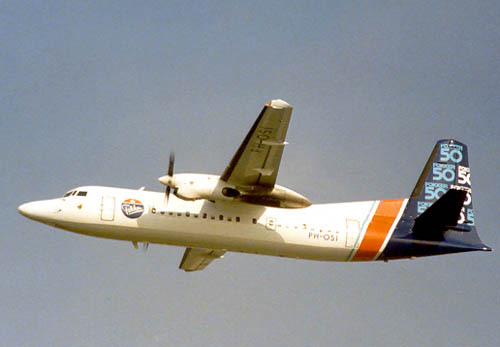 Stork, who took parts of Fokker's heritage, decided to reorganize its aviation activities as of 01Jan2010 under the Fokker brand as it remains stronger than Stork's. Fokker Services manufacturers parts for the immense Airbus A380, as well as for the Gulfstream business jet and the military Joint Strike Fighter. Some 700 Fokker airframes operate around the world, so there is still a maintenance market very much alive for Fokker aircraft. The Woensdrecht, Netherlands plant employs a workforce of 3700 people. While KLM Royal Dutch Airlines is phasing out the Fokker F.50 and F.100 aircraft, the number of Fokker F.70s with KLM is being increased to a total of 26 (over half of the total number produced). Austrian Airlines has 24 Fokker aircraft in its fleet and contracted Fokker Services in 2009 for maintenance, a contract with a value of 130 million euro. Fokker Services also modifies aircraft interiors. But there are others who benefit of the prolonged lifespan of sturdy Fokker aircraft. One such company is Aircraft Conversions, based at Amsterdam's IAP Schiphol-East (located a stone throw away from where the Fokker plant used to be!) and which converts Fokker F.50s to freighters. Fairchild produced from the Fokker F.27 Friendship a freighter version and tooling as well as know-how was usuable on the F.50. This freighter version is very versatile, can land on primitive airports, needs very little in terms of handling equipment and has a better range than the passenger version. Seven freighters have been delivered, 2 to Miniliner (of Italy) and 6 to Skyways (of Sweden). Some 190 F.50s roam the earth so this could be big business. We may see Fokker aircraft, as well as companies producing parts and maintenance under the Fokker banner, for a good many years to come! Fokker Services is a Dutch maintenance company with its headquarters in Woensdrecht and facilities at Amsterdam IAP (Schiphol), Nieuw-Vennep, USA and Singapore. the firm provides maintenance, modifications and repairs of Boeing-, Embraer- and Fokker aeroplanes. Fokker Services also provides maintenance to F-16 combat aircraft of the Danish, Norwegian and Netherlands Air Force. The company is also a partner in the Joint Strike Fighter-program. The company came into existence after the bankruptcy of Fokker Aircraft Industries and was taken over by Stork july 1996. Since then it is part of the Fokker Aerospace Group. In 2005 Fokker Services was awarded the Aerospace Industry Award for its 'Future'-program. In 2007 it took over the US firm Aerotron AirPower. Update july 2011: Fokker Aerostructures in Hoogeveen, Netherlands is doing exceedingly well, by a growing demand from military- and civilian aviation. The manufacturing for aviation components will see continued growth and expansion, esspecially composites are in high demand. The plant numbers 800 employees at the moment. (Source: Haarlems Dagblad).